It’s not to late to review how I did with my Genealogy Goals for last year, and plan ahead for 2019, right? Of course it isn’t! I’d best get on with it then and assess what I achieved, what I missed out on, what I’ll be bringing forward into this year, and any new goals that need to be added. When I set out my Genealogy Goals for 2018 at the end of Genealogy achievements in 2017 and goals for 2018, they consisted of a pair of paragraphs which did not look too taxing. But oh my, there were a lot of things to do in those 230 words! Here, I will break each paragraph down into discrete parts, listed under the original headings. Goal for 2018: Add to my collection of Atcherley death register entries from the GRO; analyse and synthesise the information contained in the collection. Goal for 2019: Acquire any additional BMD records required from the GRO before the price goes up in February! Complete analysis and synthesis of death records, and continue presenting findings as articles on this website. Goal for 2018: Identify copies of post-1858 Atcherley wills which are likely to be of particular interest and acquire them. Achieved in 2018: Six post-1858 wills of Atcherleys (by birth or marriage) acquired plus one will in which a bequest to an Atcherley was made. Also the will of Thomas Shairp (father of Christiana Shairp, who married Captain James Atcherley) downloaded from Scotland’s People website. Goal for 2018: Produce abstracts / transcripts of copies of wills and other probate documents held. Not achieved in 2018 – carried forward to 2019. Goal for 2018: Acquire digital copies of more Atcherley documents held in archives and produce abstracts / transcripts. Achieved in 2018: Digital copies of more Atcherley documents at Shropshire Archives acquired through Martin James (Family Heritage Search) and at London Metropolitan Archives through Carole Steers (Ancestry Examiner). Goal for 2019: Produce abstracts / transcripts of the above and consider further acquisitions through archival researchers and/or my own visits to archives. Goal for 2018: Catalogue, photograph and where applicable produce abstracts / transcripts of all objects held in the Atcherley Archive. Achieved in 2018: Atcherley Archive page created on this website in April 2018 as a basic catalogue of items held, updated with additional accessions in November 2018. Goal for 2019: Photograph and where applicable produce abstracts / transcripts of all objects held in the Atcherley Archive. Goal for 2018: Share images and data from above activities to the greatest extent possible (taking account of copyright restrictions) through this website and its associated Flickr account. Achieved in 2018: Article A matter of life and death (certificates) – Part 1 added to website as a result of analysis of death certificates acquired, and additions made to the Atcherley.org.uk Flickr photograph albums mean that almost all of my BMD certificates (with the exception of those relating to living people) are available online. 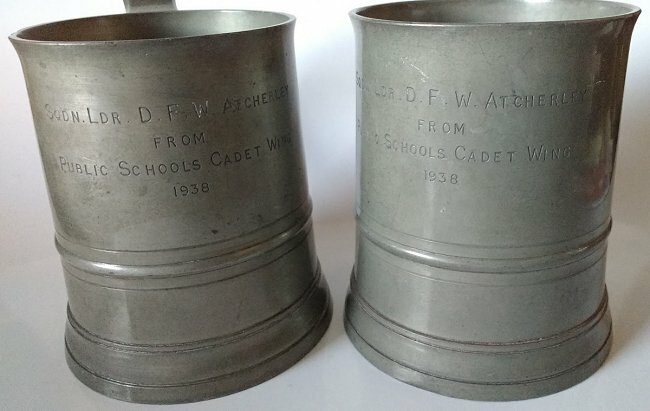 Goal for 2019: New posts and pages added to the website this year to include at least some based on records (wills, BMD certificates and archive documents) acquired last year, and on Atcherley Archive documents and other items. Goal for 2018: Increase the number of website posts (stories and articles) to at least 200 by the end of the year. Achieved in 2018: 27 new posts added in 2018 brought the the total number of posts online by the end of the year to 2013! (The number of website ‘pages’ also increased to 103). Goal for 2019: Add new posts, pages and transcripts (the latter possibly in PDF format) totalling at least 50 over the year. Goal for 2018: Complete WW1-related Atcherley stories by 11 November. Goal for 2018: Review and update existing posts to take account of new information, to the fullest extent possible. Not achieved in 2018 (although a ‘hit list’ of posts to be updated has been compiled) – carried forward to 2019. Goal for 2018: Add a subject index of posts on the website. Achieved in 2018: Topic index page completed. Goal for 2018: Work towards full cross-linking of person profile pages in the Atcherley Family Tree and posts / pages on the main website. 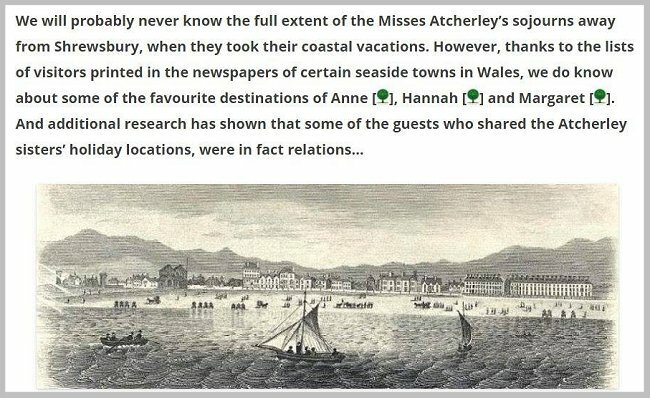 Achieved in 2018: Links between person profile pages in the Atcherley Family Tree and posts on the main website completed (tree icons in stories and articles – as shown below – link to profile pages). Goal for 2019: Complete cross-linking of person profile pages in the Atcherley Family Tree and pages on the main website. Goal for 2018: Investigate the possibility of exhibiting items from the Atcherley Archive to fellow genealogists and the wider public (e.g. through talks or displays). Goal for 2018: Contribute to the journal of the Shropshire Family History Society and/or other publications. Achieved in 2018: Article contributed to the Journal Of One-Name Studies (on the 2018 annual conference of the Guild Of One Name Studies). Goal for 2019: Contribute to the journal of the Shropshire Family History Society (and other publications if opportunities arise). Attend as many of the large genealogy shows and events taking place in 2019 as possible (attendance at the Guild Of One-Name Studies 40th annual conference, Family Tree Live, The Genealogy Show and RootsTech London already planned) . 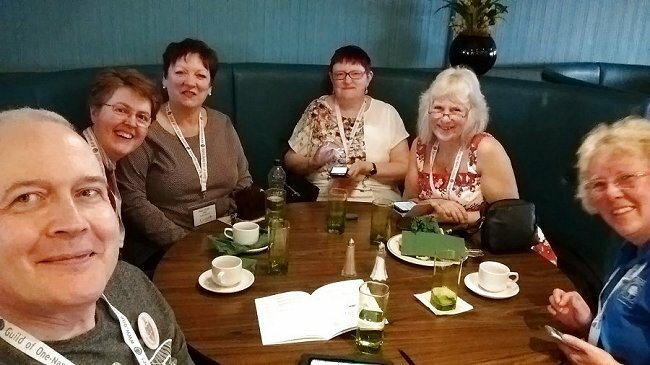 Myself (left) and fellow one-namers at the Guild conference in 2018. Assess the Atcherley one-name study against the Guild Of One-Name Studies’ “Seven Pillars of Wisdom” and add any additional goals identified by that assessment to this list. Achieving everything on my list of Genealogy Goals for 2018 in full would have been a tall order, especially as I underwent eye surgery for a torn / partially detached retina (and a period of recovery during which my computer use was restricted) during the year, and experienced further eye trouble towards the end of the year (the cause of which has now been diagnosed and is being treated). However most of my goals were achieved in part or in full, with very few not achieved at all, so overall I’m happy with what I completed in 2018. Health permitting, I’m looking forward to tackling those goals which have been brought forward to 2019 in whole or in part, and achieving the additional goals set for the year! Picture credits. 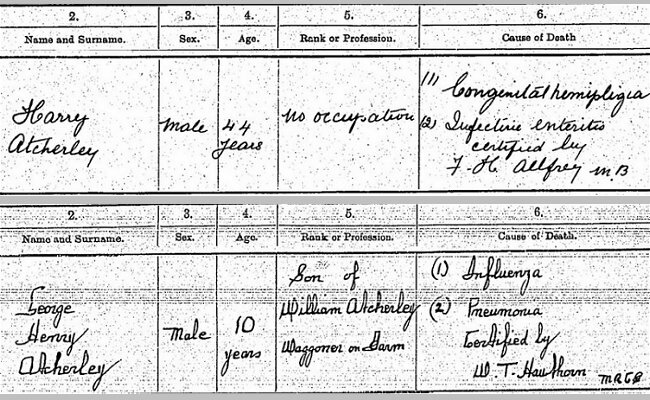 Extract from GRO death certificate for Elizabeth Atcherley: Image © Crown Copyright, posted in compliance with General Register Office copyright guidance. All other images: by the author.